Whats your home health challenge? There’s no sugar-coating it: smoking cessation is an uphill battle. In surveys of older smokers, as many as half say that they would like to quit smoking altogether. But beating the harsh chemical addiction to nicotine is only part of the equation; smoking is also a deeply ingrained habit that grows harder to break the longer a person has smoked. Some seniors may believe it’s too late to turn over a new leaf, or let past quitting attempts deter them from trying again. They may question whether the payoffs of quitting at their age will justify the effort. However, research shows that quitting is both possible and advantageous at any age, so rather than ‘Why now?,’ try asking ‘Why not?’ Read on to understand the benefits of smoking cessation and the tools seniors can use to make this the year they quit for good. Studies have shown that even after age 65, quitting smoking can add years to a person’s life. What’s more, quality of life and health can vastly improve, in several respects. Reduce disease risks and complications. Smoking is estimated to cause about 1 in 5 deaths each year in the U.S. — it’s the leading cause of chronic obstructive pulmonary disease (COPD) and many cancers, and markedly increases the risk of heart attack and stroke. It’s also been shown to increase dementia and cataract incidence and to negatively affect bone density, which can contribute to osteoporosis and risk of fracture. When you quit, your risk of heart disease is cut in half after just 1 year, and after 5 years, stroke risk drops to the level of a nonsmoker. Boost your current health. If you already have a tobacco-related illness, quitting is still your best tool to manage disease and delay progression. Health benefits begin in earnest as quickly as minutes (heart rate) or hours (carbon monoxide in blood) after your last cigarette — and the improvements continue from there. Lung function improves just a few weeks after quitting, which can lessen the overall toll of COPD or other ailments. 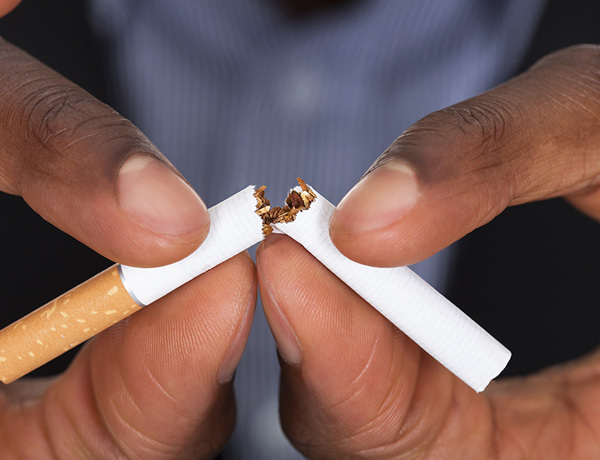 Additionally, if you take any medication, the chemicals in cigarette smoke can combat its effectiveness; quitting helps your meds help you stay healthier. Smell, taste, and save. Other benefits of quitting are more cosmetic, but also more appreciable. You’ll be rid of any smoke smell that lingers around you and your environment. Your senses of smell and taste are restored starting just a few days after quitting. And you’ll quickly be counting your cost savings by the hundreds, growing to thousands over the years. If you’re seeking personalized support, Medicare may be a great place to start. The organization greatly expanded its smoking/tobacco cessation coverage some years ago: currently, any person with Medicare who uses tobacco is covered for up to 8 face-to-face counseling sessions in a 12-month period. As with any insurance, some rules or costs may apply, depending on the specific service or circumstance, so check with your doctor to determine the course that best fits your needs and coverage. Freely available information and aid is also widespread. Government and health organizations such as the Centers for Disease Control, the National Cancer Institute, and the American Lung Association offer helpful fact sheets and advice, as do countless health websites and regional resources. A nationwide toll-free phone network is also in place to connect tobacco users in every state with trained counselors (1-800-QUIT-NOW). Take time to prepare. Quitting is more likely to be successful with advanced planning and thought, rather than being done on a whim. Once you’ve decided to go for it, choose a ‘quit date’ within the next few weeks, and build up mentally. Remind yourself why you’re ready to quit, and what you will gain. Also pay attention to your smoking habits and peak craving times, and begin to develop possible strategies for how to overcome these routines and urges. Avoid your triggers. Because the compulsion to smoke is both physical and mental, your best bet is to remove yourself from situations where you’d be most tempted. First, rid your surroundings of all smoking materials — without cigarettes, lighters, or ashtrays on hand, it’s that much harder to give in and light up. Avoid activities or rituals that went hand-in-hand with your smoking. Drinking alcohol can be an especially strong pull; if you can, give up drinking for just the first few weeks. You can also quickly excuse yourself if others begin smoking in your vicinity, and politely ask guests to refrain from smoking in your home or car. Form new habits. One helpful way to break a routine is to start a new one: if you never smoked while doing a certain activity, then you won’t be reminded of it. Take advantage of your improving health and lung function by exercising, or look for local classes or social events. Also try establishing a reward system to congratulate yourself for not smoking for a day, a week, a month, and longer. Remember that cravings are temporary. The craving to smoke peaks about 3 days after quitting, when all the stored nicotine has left your body. But an individual craving, no matter how intense, only lasts 3–5 minutes. During these times, remind yourself that the urge will pass, and have a distracting alternative planned: eat a healthy snack, call someone, or just get up and move around. After the first week, withdrawal symptoms will start to wane in intensity as well as frequency. Don’t do it alone. The numbers show that not every quitting attempt is successful, but they also show that your chances increase with proper support, like education, counseling, and/or cessation aids (such as nicotine patches or prescription medications). Start a conversation with your doctor about what medications or methods can help you quit for good. Recruit friends and family to keep you occupied and on track from day to day. Smoking cessation is a challenge, but it is attainable: in fact, former smokers now outnumber current smokers. No matter what your age or health status, not smoking can lead to considerable improvements over smoking in terms of current health, future risks, and years of life. But whatever inspires you to quit, give yourself the best chance of success by loading up on tools and information to keep you on this challenging — but ultimately rewarding — path. Quitting Smoking for Older Adults is a collection of guides and worksheets provided by NIH SeniorHealth. The American Lung Association offers masses of information about quitting smoking, including Smoking and Older Adults. Smokefree.gov, an initiative of the National Cancer Institute, helps smokers get informed, form a quit plan, and stick to it. home health care, hospice, nursing, and therapy services to families across Michigan and Illinois. Copyright © 2018 Residential Healthcare Group, Inc. All Rights Reserved.